Just three and a half hours drive from Johannesburg Ithala Game Reserve, run by Ezemvelo KZN Wildlife, offers the first-class look and feel of an expensive private reserve, but at a fraction of the cost. For this reason, it remains one of my favourite South African game parks. You won’t see the Big Five here – there are no lions – and other big game drawcards including leopard and hyena are seldom seen. But you should have no problem spying rhino, buffalo, zebra, impala, wildebeest, and giraffe. The park is also home to several species of game not easily seen in bigger wildlife parks such as the red hartebeest and tsessebe. Rhinos were particularly in abundance while we were here as were giraffe. While the park is not particularly impressive in terms of sheer numbers of animals, the scenery is breathtaking with the reserve sweeping down the side of the magnificent Ngotshe Mountains into lushly vegetated riverine valleys highlighted by some of the world’s oldest rock formations. Another big attraction of the park for me is that as it’s less popular than other parks such as Kruger, you’ll virtually have it all to yourself – bliss! This is a very scenic reserve, with an altitudinal span of more than 1,000 metres, that can easily be visited in conjunction with other better-known ‘Zululand reserves’ such as Hluhluwe-Imfolozi, iSimangaliso ad Mkhuze. The wildlife is less impressive than the scenery, though there is a good chance of seeing white rhino, giraffe and elephant, and on our most recent visit we lucked a brief but gratifying sighting of a leopard crossing the road. I was also impressed by the variety of antelope and birds we saw on most game drives. In many respects, my favourite aspect of this park was the main rest camp, which lies on a rocky, densely vegetated slope and supports plenty of birds and rock hyraxes. Based on our most recent visit, the rest camp is perhaps the most reliable spot in South Africa for close-up nocturnal sightings of the bug-eyed bushbaby and lithe spotted genet (a rather catlike relative of the weasel). Ithala is the northernmost of several excellent small reserves in northern KwaZulu-Natal. Its dramatic topography, which falls more than 1000m from rocky cliffs and high grasslands to riverine bush and thorn scrub, means that it offers a rich variety of habitats in a small area – and a corresponding wealth of wildlife. Elephant, buffalo and both species of rhino have all been introduced, and I have enjoyed the adrenalin-fuelled thrill of tracking black rhino on a guided trail. Large predators are scarce, and lions absent, but look out for an abundance of giraffe – this being the southernmost limit of their natural range – and a rich variety of antelope. Birders will find such rarities as lappet-faced vulture and bald ibis, among the huge variety of birds for which this corner of South Africa is celebrated. Ntshondwe Camp, the main accommodation, is spectacularly sited on a steep hillside of aloes and rock stacks, but may be too large and organised for some tastes. By contrast, the three tiny bushcamps each accommodate only a handful of guests and feel far more remote; during my night at Thalu Bushcamp, a genet came sniffing around the campfire and greater bushbabies rummaged through our kitchen. In 1884, Zulu King Dinizulu granted a large swathe of land in what is now northern Kwazulu-Natal to 800 Boer farmers in exchange for military services against the British. Overfarmed and heavily eroded, it was eventually returned to the wild and today it is one of the least known and most scenically beautiful of South Africa’s reserves, now covering 290 sq km (112 sq miles). In restocking the park, the authorities have concentrated on returning those species which were native to this area of the country with 23 species of mammal reintroduced including black and white rhino, cheetah, leopard, elephant, buffalo, kudu, tsessebe, red hartebeest, eland, brown hyena, and the giraffe which has become the park’s symbol. With open grassland, the opportunities for spotting antelope and rhino are brilliant. The skies above were not neglected either with species such as Whitebacked, Lappet-faced and Cape vultures returning to the air along with black eagles, bald ibis and red-billed oxpeckers. You also have a better chance than in many places of seeing rare species such as the aardvark, aardwolf, honey badger, and pangolin. There are no lions. On the down side, the park isn’t as game-rich as the better-known parks and there are no lions. But to me, it is the land itself that is the star here. The landscape is carved from some of the world’s oldest rocks, dating back a mind-boggling three billion years. The terrain within the park varies in altitude from 400-1,450m above sea level, swooping down the steep Ngotshe Mountains to the Phongolo River valley. 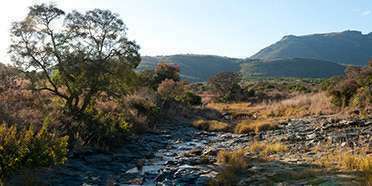 There are areas of mountain thornveld and scree slopes dotted by wild fig, cabbage and candelbra trees, but what I remember most vividly are the endless golden fields of shimmering tall grass, occasionally broken by a granite grey lump sometimes a rock, sometimes the flick of an ear giving it away as a browsing rhino. Being here felt free. Ithala’s main camp, Ntshondwe, is ingeniously camouflaged among wild fig trees at the foot of towering pink and russet sandstone cliffs. From here it’s a short walk to a waterhole, where the sight of rhino and elephant droppings instantly raised my expectations of what there was to see in the park. I wasn’t disappointed, and saw grazers on the grasslands including eland, giraffe, kudu, blue wildebeest and zebra, as well as the normally shy and rare tsessebe, plus good sightings of rhino in the woodlands and black and Martial eagles on the cliffs. While Ithala doesn’t have great herds of game in terms of size as other parks, and it’s a bit out of the way, it is home to four of the Big Five (not lion), and the camps are ideal for spending a few relaxing days in the bush. Ithala Game Reserve lies in the rural heartland of KwaZulu-Natal. To get here you’ll drive along the scenic rolling hills dotted with picturesque Zulu homesteads. Ithala is not a big park, but it visually continues outside its borders. The high cliffs and open grassland characterize this scenic park. The cliffs are home to many rock hyrax, which also like to hang around the camp. Bald ibis and black eagle are some of the cliff-associated birds that can easily be spotted here. The open grassland is a good place to see a big variety of grazers. Some of the more unusual ones being the oribi, usually seen in pairs, and the very fast running tsessebe. As in the other KwaZulu-Natal parks, this is a great place to see black and white rhino. I can recommend doing a walking safari here, which can be booked at the camp. An especially exciting experience for me was approaching a black rhino on foot.